There’s something about a show—especially a sitcom—having a good sense of memory that can perk things right up. Part of that comes from the knowledge that continuity wasn’t always the biggest priority when it came to television shows, at least not outside of characters keeping some basic character traits. (I’ve been rewatching a lot of Boy Meets World lately, so it’s a matter that’s fresh in my mind.) So something like Brooklyn Nine-Nine acknowledging that its lovable crew are still on the night shift feels like a big deal, even though it’s technically just basic storytelling. Because the fact that they’re still working night shift is a big deal; it affects the way they behave, the types of cases they get, and their relationship with their loved ones. Which leads to a cold open with yet another Holt outburst to cut to the opening credits: “THE FULL BULLPEN!” These outbursts have become fairly regular occurrences this season, and while they may seem out of character at times, Brooklyn Nine-Nine has done quite a good job in continuing to ground them in the realm of competition and success. Jake suiting up to slide “the full bullpen,” from Holt’s office to the elevator, may not sound like the type of thing Holt would appreciate—and the cold open even has Jake terrified of Holt’s reaction—but it’s still a victory. A small one, but that’s the type of thing Holt can appreciate, especially during the night shift. It’s a straightforward description of a plot that sounds humorous enough, but it’s certainly the trio of Holt, Amy, and Rosa (as well as their characteristic behavior during it all) that makes the plot work as well as it does. There’s stressed out Holt, a model-making Amy, and a teasing Rosa. It’s a plot that could go plenty of other places—there’s much more to milk out of the fact that Amy “betrays” Holt by calling out how he’s wrong in the “Monty Hall problem”—but it doesn’t fall into the trap Brooklyn Nine-Nine can sometimes find itself in where it leaves the audience wanting so much more. It’s a tight plot, and that’s truly indicative of the quality of the rest of the episode. Like the Gina/Boyle plot, which is about a Boyle family vacation (in either Iowa or Aruba) but never needs to get to that point to reach the peak of its humor. Like the night shift thing, just the very act of addressing that Gina and Boyle are family now is a little thing that goes a long way. It’s a major part of their characters, and while it doesn’t need to be mentioned weekly, there’s plenty to mine from that particular aspect of the characters. Plus, force of nature Gina Linetti in a sea of perfectly average (to the point of being very egg-based in their diets) Boyle family members is a no-brainer of a plot. The way the episode approaches it, by having her work to impress and sway them, however, is a twist on a typical approach to such interactions. And it also shines some light on little Boyle things like their constant “I love you”s, the fact that Pirates Of The Caribbean gave them all “nightmares for months,” and the useful tidbit that they all appreciate size seven aqua socks. Every single one of them. Then there’s the A-plot, as it works with the reliable Terry/Jake dynamic, with a few tweaks. The norm is set with Jake annoying Terry in some form, but here, the plot focuses a lot more on Jake just trying to make Terry’s nerdy dreams come true… and Terry leaning fully into them. Obviously, Terry is a sensitive character, but this episode doubles down on his childlike exuberance for the show’s Skyfire Cycle novel series. 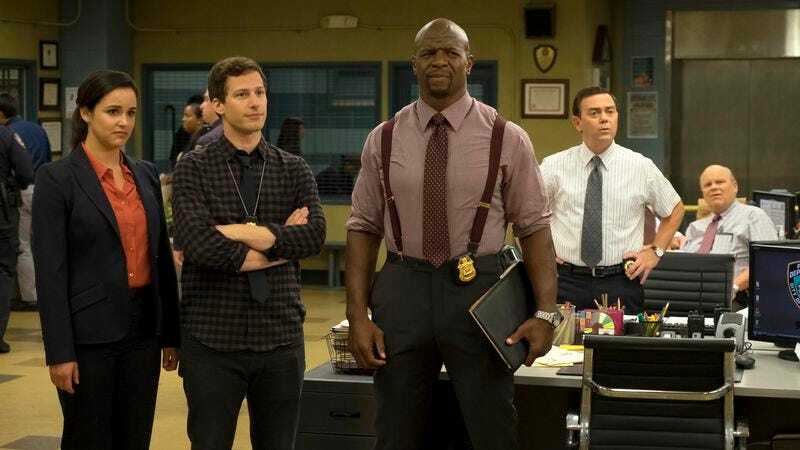 Brooklyn Nine-Nine is a show with characters who all have very specific things that can get them excited in this way (there’s a hint of that with Amy’s “Enough foreplay, let’s get to the numbers.”), and while that can go over-the-top at times, this week’s episode has the right amount of that when it comes to Terry’s fan excitement. Early on, there is the hint of an ulterior motive in Jake wanting a big case like the people at the Nine-Five get, but the episode actually fully commits to this being something Jake is doing solely for Terry. And any of Terry’s frustrations with Jake in this plot specifically come from his own nerves about meeting his personal hero, Skyfire Cycle author DC Parlov (an exceptional Fred Melamed). While the Holt/Amy/Rosa plot has some of the typical Rosa teasing in Amy’s direction, and there’s the expected antagonism and mild Boyle pushback in that plot, the Terry and Jake plot is just a good old-fashioned friendship caper. The twist that Parlov didn’t actually sign Terry’s book (or remember him from his childhood) is one of those “expected” plot points, but it doesn’t lower the quality of the episode or the story; it’s all about showing the strength of Terry and Terry/Jake’s friendship, and it does that perfectly. Also, the reveal that Terry’s hero Parlov really does “got more babes than he can handle” (“he puuuuulllllssss”) is certainly something. That really describes a great deal of this episode: It’s all “certainly something,” in the best way possible. There’s an entire runner about Patrick Ewing, which leads way to a reveal about Jake pantsing more New York Knicks (“How many Knicks have you pantsed?” “Including coaches? Five.”), all because he apparently pantses his heroes, in general (“It happened again!”). As mainstream as it is, Brooklyn Nine-Nine is truly a weird show at heart, and it’s always nice when it shows just how weird it really is. All in the name of friendship and humor. 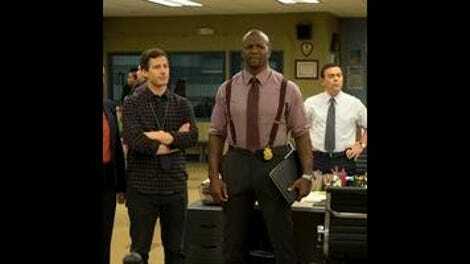 Say it with me: Nine-Nine! This week in webisodes Brooklyn Nine-Nine needs: Jake Peralta hosting a ska review series. Every webisode ends with his attempt at skanking. 1998 Jake: “Ska defines who I am as a person, and I will never turn my back on ska.” I hoped he would skank after saying this, and then he did. Oh how he did. There’s something absolutely amazing and a bit awe-inspiring about the idea of Holt ranting for 40 minutes about anything, but for it to specifically be about his “need to bone,” it’s really special.